Build a new home, office space, or mini-escape using one of EZ Log’s awesome kits featuring wood blocks that can be stacked up like LEGOs! The kits come in over 200 designs and employ a tongue-and-groove construction for easy stacking — most spaces can be assembled (and disassembled) in just 1-2 days. The wood is obtained from sustainable forests in Northern Europe, and the kits come complete with flooring, roofing, windows, doors, locks and all hardware. DIY summer home project, anyone? 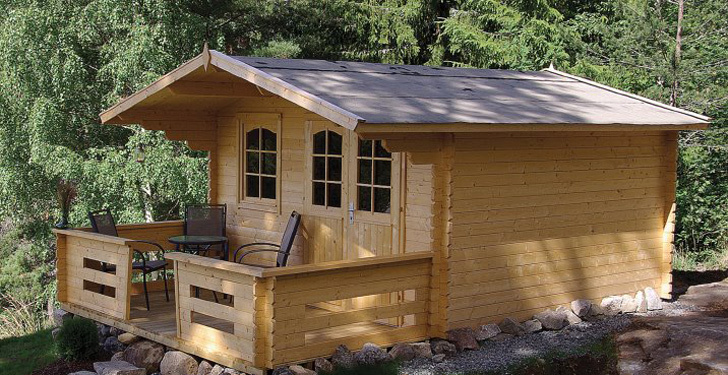 EZLOGS buildings can be built with double walls and insulated to any R-Value and Also double roofed or an attic area for insulation. There are endless possibilities for design and they are very affordable option for large or small housing or buildings of many uses. So great! This could be used for so many things. There's some very constrained information on their site, but near as I can see, these are stacked, interlocking vertical boards with no provision for insulation. No construction videos, no testimonials, no in-situ visits to completed projects with folks living in them. Build a new home, office space, or mini-escape using one of EZ Log's awesome kits featuring wood blocks that can be stacked up like LEGOs! The kits come in over 200 designs and employ a tongue-and-groove construction for easy stacking -- most spaces can be assembled (and disassembled) in just 1-2 days. The wood is obtained from sustainable forests in Northern Europe, and the kits come complete with flooring, roofing, windows, doors, locks and all hardware. DIY summer home project, anyone?